The following is a timeline showing key events in CILIPS history. You can also view a list of notable persons in our history here. Founding meeting of Scottish Library Association (SLA) in Edinburgh. First Honorary Member - JWY MacAlister, Royal Society of Medicine, London. Annual and Winter meetings suspended as many members put library work aside to go off to war. First Branch Structure - Branches set up in Glasgow & West of Scotland, Edinburgh & East of Scotland, Dundee, Aberdeen & North of Scotland and first SLA summer school for people studying for the Library Association exam. Honorary Secretary writes to Secretary of State for Scotland expressing concern about serious financial position of Scottish libraries. First woman council member elected – Miss Maud S. Best. Earl of Elgin and Kincardine becomes first Honorary President. SLA agree to affiliation with the Library Association (LA). Five chief librarians are called up to the war with immediate effect. SLA continues to function through war years but services are affected. The temporary appointment of married women in libraries is approved. First newsletter produced for SLA, edited by A. G. Hepburn. Scotland's first library school established at College of Commerce, Glasgow. Public Libraries (Scotland) Act 1955 c. 27 comes into force on 6th May. The SLA newsletter becomes a journal called the SLA News, edited by Robert Walker. International Federation of Library Associations (IFLA) conference held in Edinburgh. Second Library school in Scotland established at Robert Gordon’s Institute of Technology, Aberdeen. First Scottish/Irish joint conference takes place in Portrush. Standards for public library service in Scotland are published. Office for SLA established in Motherwell. 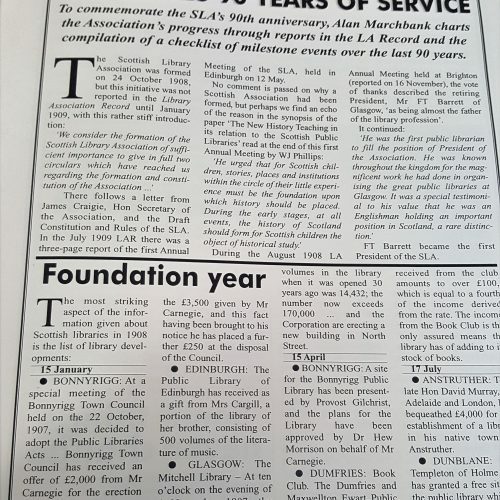 SLA News changes its title to 'Scottish Libraries'. COSLA Public Library standards published. Creation of Scottish Library and Information Council (SLIC), an Independent advisory body for library authorities and the Scottish Government. SLA Executive Secretary (Robert Craig) seconded to work for SLIC on a part-time basis. Joint conference held with the French Library Association. SLIC/SLA publish FE College Library Standards. Renegotiation of the affiliation agreement between SLA and LA. First Celtic conference in Peebles – joint conference between LA Ireland / Library Association of Ireland / LA Cymru Wales / SLA. Joint working relationship established between SLA and SLIC. Library Association merge with Institute of Information Scientists to become Chartered Institute of Library and Information Professionals. SLA membership votes to change its name to Chartered Institute of Library and Information Professionals in Scotland (CILIPS). IFLA conference held in Glasgow. Third Celtic conference takes place in Cardiff. SLIC and CILIPS agree to disband their collective working agreement. CILIPS move into separate offices in Glasgow.